Update: Starlet was humanly euthanized on August 16, 2016 and is buried near the tobacco barn. She has left us with a wonderful horse, Fred, who reminds of us of his mother in evey way. 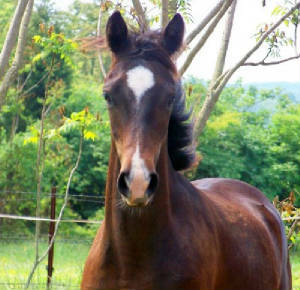 Starlet was loved and well cared for and when the time came she was ready for eternal rest. Starlet, thank you for everything. Like his mother, Fred has his favorite song. Normally high spirited and skittish, the "DO-RE-ME" song from the Sound of Music seems to quiet him. Currently it is sung while clipping, driving, and leading past a white horse (Fred is terrified of the pinto). If you are in the ring and you hear me singing then you'll know that it is Fred and me. Below is Fred being worked for the first time in a carriage harness (he will be driven in open fields this summer) and the third time driven outside the confines of the indoor arena. Like Starlet, Fred is a special horse and like his mother he will stay with us until I can no longer care for him. Such is the "magic" of the Morgan horse. Click here to play video of Fred being sung to. Photos taken on April 29, 2011 at age 22. 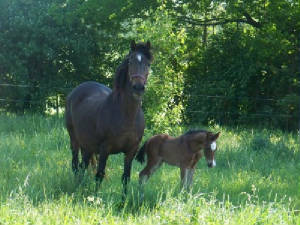 The following pictures of Starlet with her new foal (R'surene Harlequin) were taken on April 29, 2011. For those of you who are not familiar with Starlet's story, she was presented at the 2009 Cochran Auction. 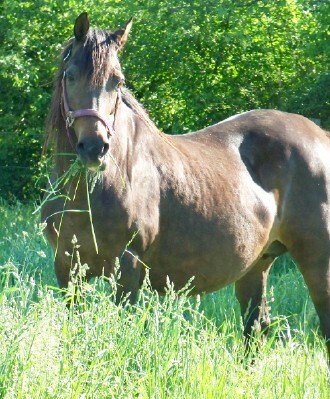 When no one bid on her the owner mentioned to us that she could not take Starlet home as the mare could no longer produce having lost her last foal and her husband did not want to feed an old barren mare. 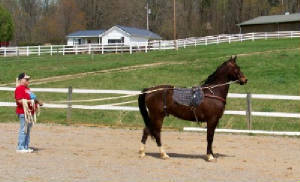 Afraid to leave Starlet abandoned at the auction barn, we offered to purchase the skinny frightened mare. The following spring (2010) we bred her to Winston and let nature take its course. 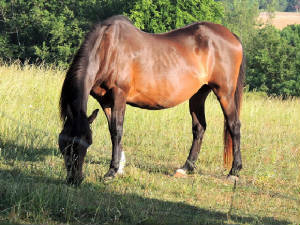 During her confinement, Starlet was not approached by veterinarians nor was she caslicked (what we were told to do); instead, she was turned out with her friends until it was time to bring her in to foal. Starlet delivered on April 26, 2011 at 7:15 AM. 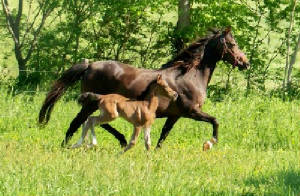 Chris had just gone in to feed the dogs when he looked out and saw that Starlet had foaled. Without much fuss or fanfare, Starlet was again a mother. 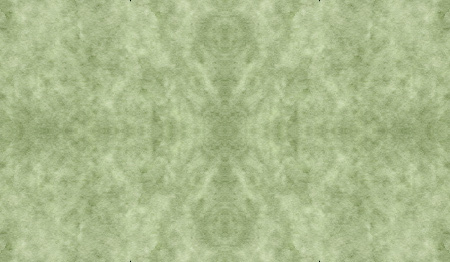 R'surene's Harlequin a.k.a. Fred, is the most colorful foal we have ever produced. 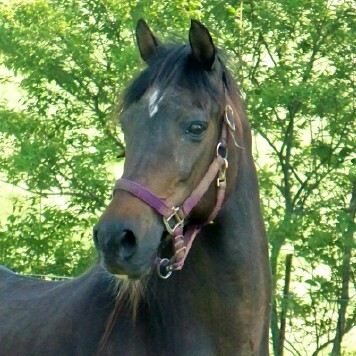 With three white socks, a large star and snip, combined with his dark bay coloring, Fred is the apple of his mother's eye and of all who see him. With this colt, Starlet has more than paid for her room and board. 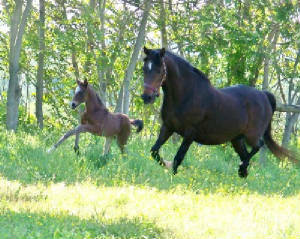 This may be her last colt; either way, Starlet will never end up at an auction. She will always have a loving home here.